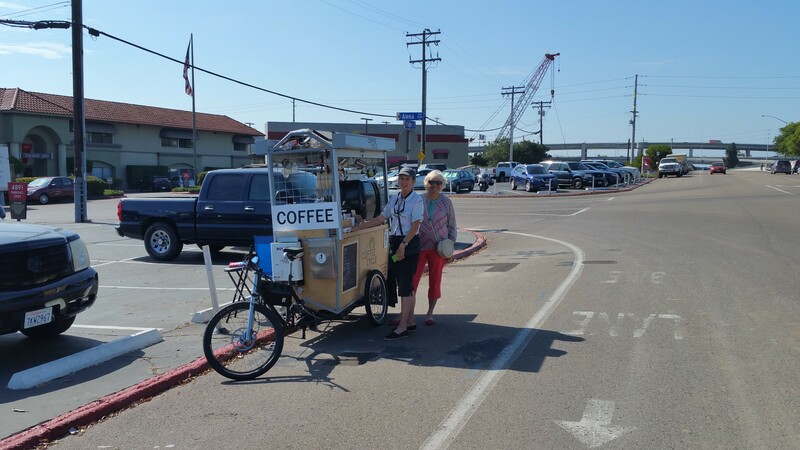 I thought it was a mirage when I came off the San Diego River bike path and turned north on Pacific Highway: there was a large “coffee” sign beside the bike lane. 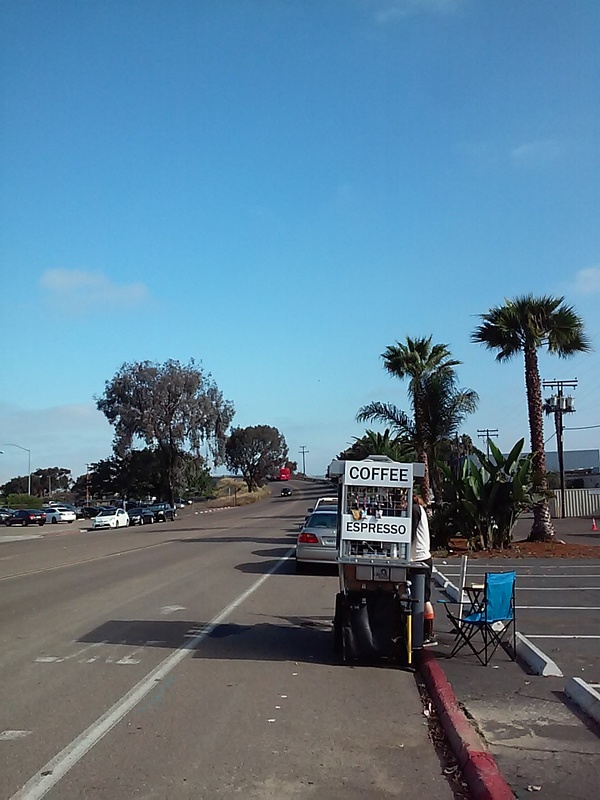 As I cycled closer I realized I wasn’t seeing things, there indeed was a coffee cart along Pacific Highway. There was another biker ordering coffee, so I patiently waited my turn before ordering what he said was a favorite among his cyclists: a cappuccino, served in a small glass no less (in other words, no Styrofoam or paper cup). Chris, the friendly barista, created the cart from scratch. I was still in a bit of a haze (“Am I really drinking a cappuccino along industrial Pacific Highway?”), but the coffee woke me up enough to start asking questions about his business. 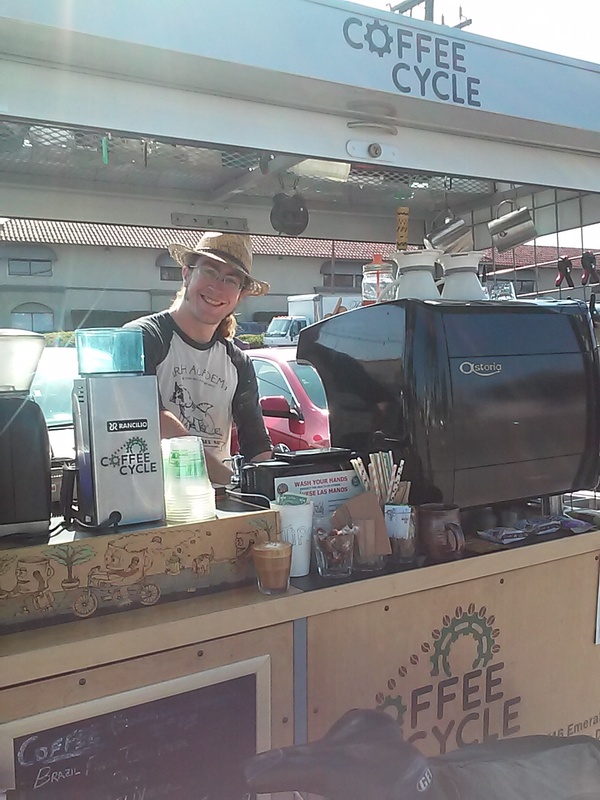 Chris, the creative barista & entrepreneur of Coffee Cycle, actually made the cart that can be pulled behind a bicycle. But that was the easy part. To actually make coffee from a cart one needs electricity…no problem for industrious Chris, his solar panels & a lithium battery do that. These also provide electricity for a refrigerator & his water pump. His water source is industrial strength bags of fresh water strapped on the cart. There were of course steps to get a city license & health inspection, but he passed them all to open earlier this year. He’s usually open Mon.-Fri. from 7:00am to 2:00pm. On Sundays you’ll find him working as a barista at Bird Rock Roasters (http://birdrockcoffee.com/) . He has a full coffee & tea menu offering just about anything a coffee shop will make. His beans are roasted by Bird Rock Roasters, but his vanilla & lavender syrups are home made. I’m not usually a fan of syrups, they’re too sweet for my palate. But both of his syrups are made from fresh vanilla bean or lavender, without the taste of additional artificial sweeteners. If you’re not on a bike, look for parking along Pacific Highway, just not in the red zones. I returned with a car & had to park about 2 blocks away. If he’s not there in the time window I gave above he may have moved on to his next dream: an actual coffee shop. It’s possible to stop without a bicycle, just don’t park your car in the red zones. Here’s to dreams & the hard work that make them happen! Here’s to coffee that new studies have found help us live longer! This entry was posted in award winning coffee, coffee cart and tagged bicycle coffee cart, Pacific Highway. Bookmark the permalink. How exciting. A totally green coffee shop. I love it. Thanks for sharing these neat out of the way places.